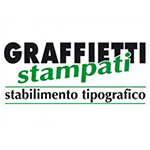 Promotion going to Graffietti Stampati directed only to new customers. With an advance payment by bank transfer you can enjoy a discount of 20% on magazines, newspapers, pamphlets, books and travel guides. An initiative that Graffietti Stampati fielded to give a jolt to the crisis and facilitate the publishing world in these times suffer much more than other categories. Be careful though, the promotion is not applicable on all offers. Request a quote and see if your request can enjoy a discount of 20%.